With customers, branches, and subsidiaries in over 20 countries, CAQ AG Factory Systems has established itself as one of the worldwide leading providers of CAQ systems. We have over 30 years of experience in the development and distribution of modular, multilingual, and industry-specific management solutions for application in the quality, environmental, and production sectors of small and medium-sized enterprises. Speculative applications for positions in software support, software sales, and software development are possible at any time. 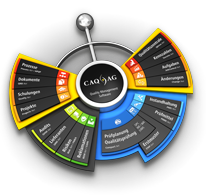 Simply send your application including your salary expectation to our personnel department at MeineZukunft@CAQ.de. We look forward to hearing from you.